?The 2019 track and field season kicked off on March 14 in Mount Angel for a number of teams, and while the Kennedy Trojans and St. Paul Buckaroos are no longer direct league rivals, the two teams squared off once more at the Kennedy Icebreaker. On the boys side, St. Paul pulled out a third-place finish at the meet with 84.5 points. Scio took first place at 138.5 points, while Salem Academy followed with 116. Kennedy followed the Bucks with 49. 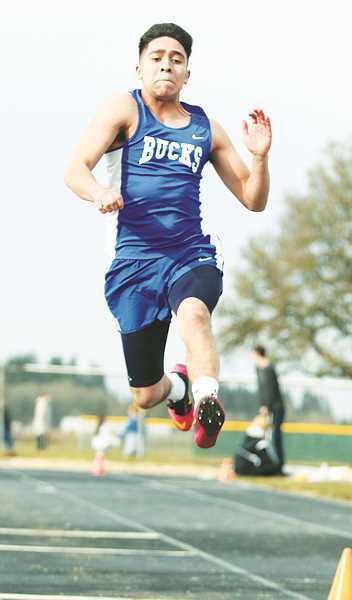 The Bucks were led by senior Gianni Grasso, who placed first in the 200-meter dash with a time of 24.08, outpacing the rest of the field by more than a second. St. Paul also netted a number of runner-up finishes. Sophomore Broden Lear took second in the 1,500 with a personal-record time of 4:46.61, leading the field for the majority of the race before Scio junior Luke Jones overtook him in the final 200 meters. Lear also took second in the 3,000, once again setting a new PR with a time of 10:28.95. Senior teammate Francisco Vargas-Ayala added a second-place finish in the 400 with a time of 58.45, narrowly losing out to Willamette Valley Christian's Sam Strauhal (58.27), but edging past Scio's Kade Mask (58.47) by fractions of a second. Vargas-Ayala also placed third in the long jump, setting a new PR of 17 feet 6.5 inches. Sophomore Adam Cook also picked up a runner-up finish, posting a time of 19.31 in the 110 hurdles, and matched his best placing in the high jump after clearing 5-06. Connor also finished runner-up in the 3,000 with a time of 12:55.73. Junior Stephanie Morales added a third-place finish in the high jump with a mark of 4-04, while Valeria Vargas-Ayala also placed third with a distance of 28-01 in the triple jump. Freshman Rianna Nowlin gave the Bucks one more third-place finish in the 100 hurdles with a time of 20.51, followed by Morales at 21.33. The Bucks closed out the first week of the season at Jefferson High School on Saturday. Bolstered by a number of athletes from the softball team, St. Paul girls finished fourth of 20 teams with 61 points. The pair teamed with Sadie Smith and Taysha Veeman to place first in the 4 x 400 relay with a time of 4:41.80. Vela, Veeman, Smith and Vargas-Ayala also teamed up in the short relay, taking home a second-place finish with a time of 55.24. Connor took home second place in the 3,000, finishing in 12:24.30 to break her previous PR she set as a sophomore by 10 seconds. The boys team finished fifth in the field of 23 teams with 39 points. Grasso doubled up on his win in the 200 at Kennedy by doing so again at Jefferson, setting a new PR of 24.00. He added a second-place finish in the 100 with a time of 11.94. Grasso teamed with Cook, Jaden Thompson and T.J. Crawford to place second in the 4 x 400 relay with a time of 3:50.19. Lear scored a pair of top-10 finishes in a crowded field in the distance events, placing fourth in the 3,000 (10:32.34) and fifth in the 1500 (4:47.23).